Melbourne researchers have discovered a new way to interpret mammograms that could transform routine breast screening and save lives. Professor John Hopper said the new technique makes it possible to predict with 30 per cent more accuracy which women will develop breast cancer in the future. “We’ve discovered that the best predictor of a woman developing breast cancer in the future is how much of her mammogram is covered by bright areas — even more than all the known genetic factors discovered over the past 20 years,” said Professor Hopper, Director of Research at the Centre for Epidemiology and Biostatistics. Professor Hopper said the findings, published in the International Journal of Epidemiology, open up possibilities for personalised prevention of breast cancer through screening. Radiologists have long known that areas of breast density, which show up as white on a mammogram, are a risk factor for breast cancer. They pay particular attention because these white areas can also hide existing cancers. However the research team decided to switch focus away from white areas to bright areas, which have not previously been viewed as significant. 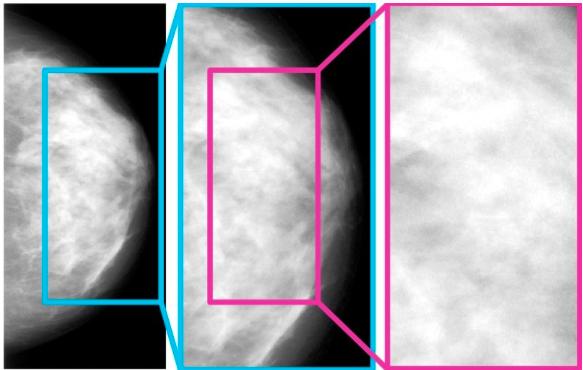 “While the white areas are important for hiding existing breast cancers, we found that it is the bright, not white, spots that provide information about future breast cancers,” Mr Nguyen said. Professor Hopper said not all women have the same risk of breast cancer. “Fortunately, for 50 per cent or more of women, their lifetime risk is low, at a few per cent. But for the remainder, the risk can vary greatly. Professor Hopper said his colleagues are now working on digital automation to make this technique available for screening services, and conducting more research on why brightness predicts increased risk and how these findings can be used to improve screening. Professor Hopper acknowledged the support of Australia’s national BreastScreen service, and the women across Australia who made this research possible. They include sisters from the Australian Twin Registry, and volunteers from the Breast Cancer Network of Australia, the National Breast Cancer Foundation’s Register4, and the Australian Breast Cancer Family Registry. Professor Hopper is a member of INFORMD, a group of leading Australian breast cancer researchers who last week launched a campaign for women to be told whether they have extremely high breast density, as this is estimated to represent a four to six-fold increased risk of cancer.